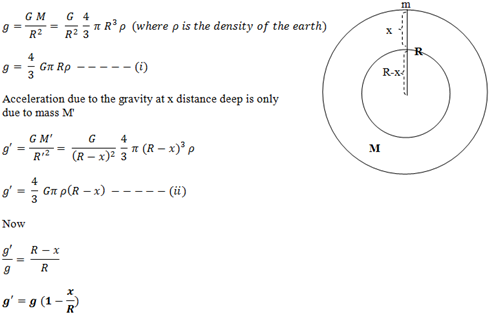 Let us consider the earth to be spherical mass of ‘M’ and radius ‘R’. A body of mass ‘m’ is placed initially on the surface and finally taken x distance deep into the earth. This expression shows that acceleration due to gravity decreases as we go deep into the earth. At the centre of earth x=R, so g’=0. Hence, the acceleration due to gravity at the centre of earth is zero (0).